Want to expand your wardrobe without spending any money? Adjust your clothes yourself. 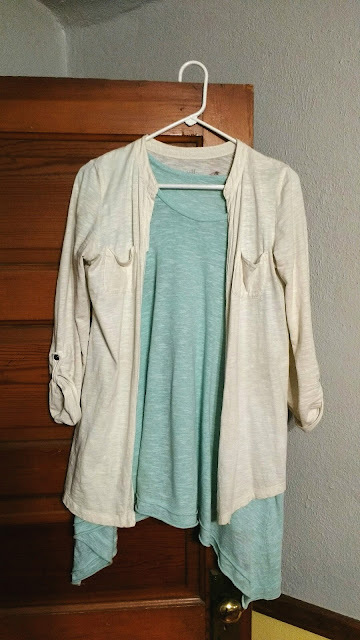 Old, worn, stretched out long sleeve shirts are perfect to cut up the middle and make cardigans. When they're cut, they don't have to fit as a shirt does, but rather they can be loose. Once they're cut up the middle you can easily push the sleeves up and let the front just drape. This can also work with short sleeves as well. What I really like about this is you're not out anything if you don't like it, it was a shirt that you didn't like anyway. Here a photo of one my mother-in-love did for me. This is one of my new favorite cardigan/jackets. Can you believe it used to be a shirt? Another bonus, no need to sew a hem either. If you want you can, but its not necessary. 1. Turn those old pants into capris & then later into shorts. 2. Cut the neckline off a shirt that you don't like and make as an over shoulder style. Or don't cut as much and just have a little wider neckline. 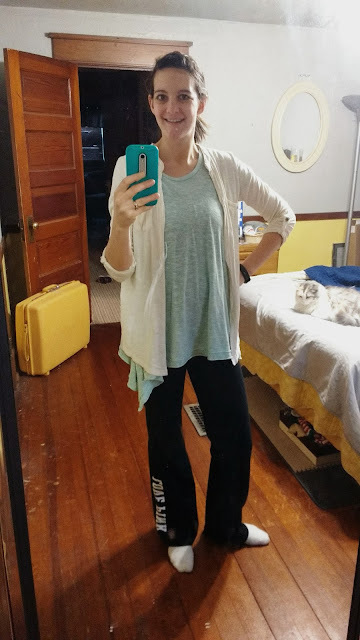 How are some ways you stretch your clothes to last longer or use a different way?